The china pattern is Autumn by Lenox. The engraved silverware is Chantilly by Gorham. The crystal is Lady Anne also by Gorham. Recently a dear friend had very serious open heart surgery to repair an aneurism in his aorta. In his third week of recovery we decided he was up to a celebration dinner party at our house. So we invited him and his wife, another couple, and a dear friend who recently turned 95! With this diverse group, I decided a seafood dinner would be most appropriate. We started the evening around 6:30 with wine and cheese by the pool. The weather was perfect! Wine and cheese were served by the pool. There was baked brie with walnuts and dates, which is always a popular choice among our friends. I threw in a little French surprise just for fun – ice cold radishes with butter and salt. Turns out the guest of honor loved the radish appetizer. He said he used to pick radishes from his mother’s garden growing up, and the radishes brought back warm memories for him. Isn’t it fun when you can make a nice memory for someone? Who knew? Here’s my dinner menu. We moved to the dining room for dinner. 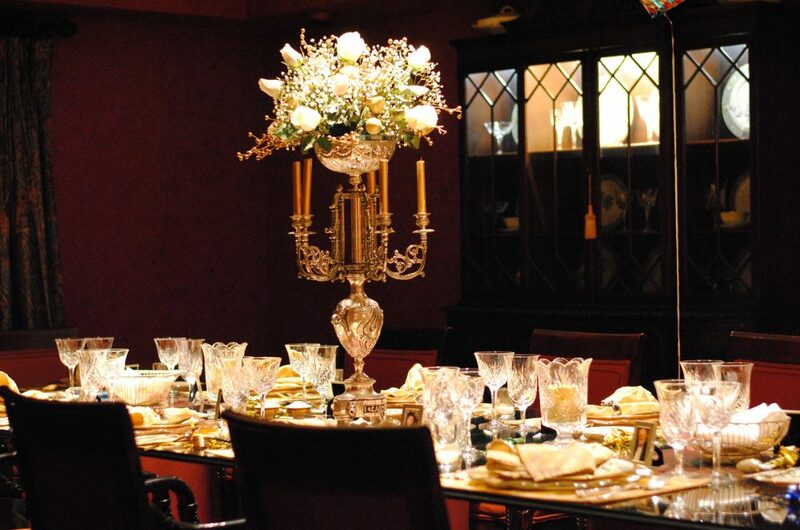 The table was set with our Autumn Lenox china, our Lady Anne crystal by Gorham, and the Gorham Chantilly sterling silverware my husband inherited from his mother. 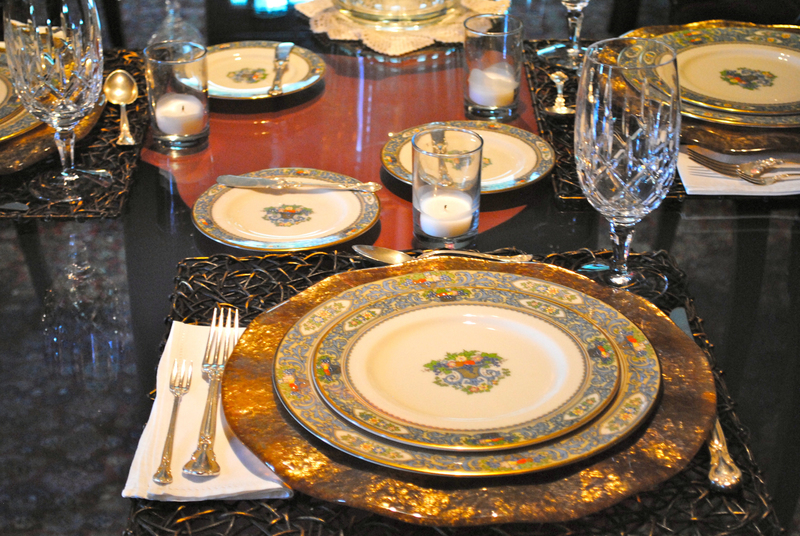 We used our gold ruffled glass chargers with the Lenox. I love these chargers from Pier 1 because they look like Annie Glass. The sterling is engraved with my mother in-law’s three initials. When she died, her friends said she was the only lady left in the County who knew the correct forks to use. She was quite an elegant hostess and loved to entertain the local and state politicians. I think she would be delighted that we are using her sterling silverware when we entertain. 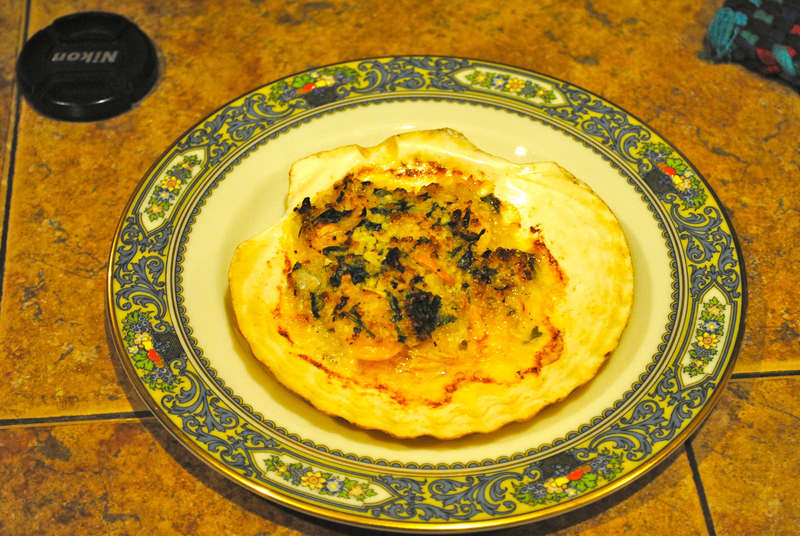 Our dinner started with Shrimp Gratin (inspired by Ina Garten’s Bay Scallop Gratin) I love this dish because it can be made ahead and kept in the refrigerator until right before dinner. Bring it out about 20 minutes before you bake it and let it come to room temperature. It’s so much fun using the scallop sea shells! Guests always “ooh and aah” when I serve with them. I have quite a collection in every size. 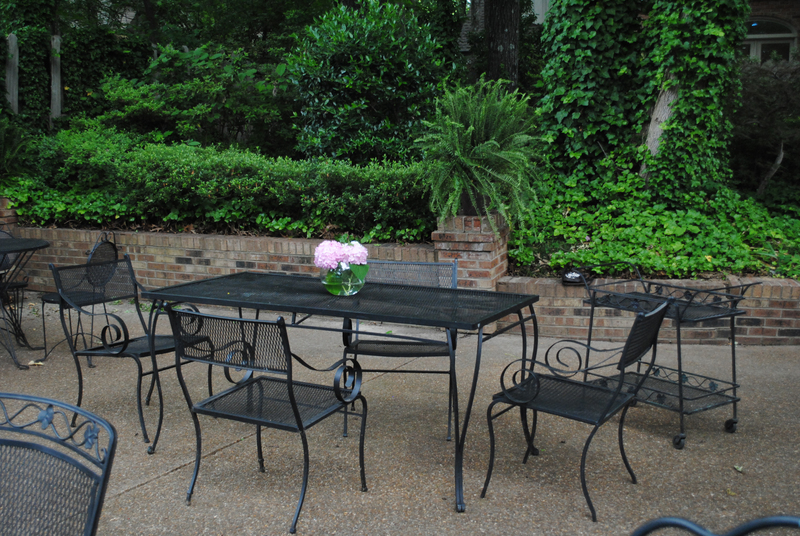 They are so easy to find at Memphis estate sales. The entree was seared cod with risotto and fresh asparagus. I usually sear the cod (or Chilean sea bass) on my Jenn-Air gas grill in the kitchen. On this evening, I prepared it on the gas burner of our Char Broil Red gas grill out by the pool. There was no grease splatter to clean up inside, which I loved! Dessert was an ice cream delight inspired by a Sandra Lee’s Ice Cream Bomb Cake. This was an easy and delightful dessert for a summer evening. I’ve served it twice and there was not a drop left on the dessert plates either time. So, I’d say it’s a hit and a keeper! All you do is thaw the french vanilla ice cream in the refrigerator for about 30 minutes until it’s soft enough to stir. Then I dish it into small round individual ramekins, the ones I use for creme brulee, and let it freeze until it’s quite hard – about 2 hours. Then melt some Polaner’s Raspberry All Fruit in small sauce pan until it’s pouring consistency. Drizzle the raspberry sauce on the dessert plate and then turn the ice cream out on top. It comes out easily after setting it in hot water for 10 seconds. 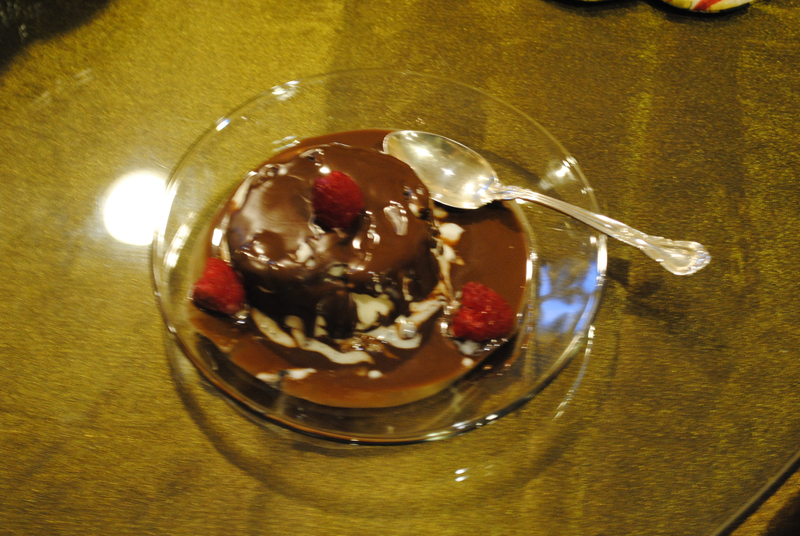 Then completely cover it with Magic Shell fudge chocolate and garnish with a few fresh raspberries. It makes a very dramatic dessert!